When thinking about what I would write for this blog, it was before our main spring bloom season, just at a time when the sight of things to come was teasing us. 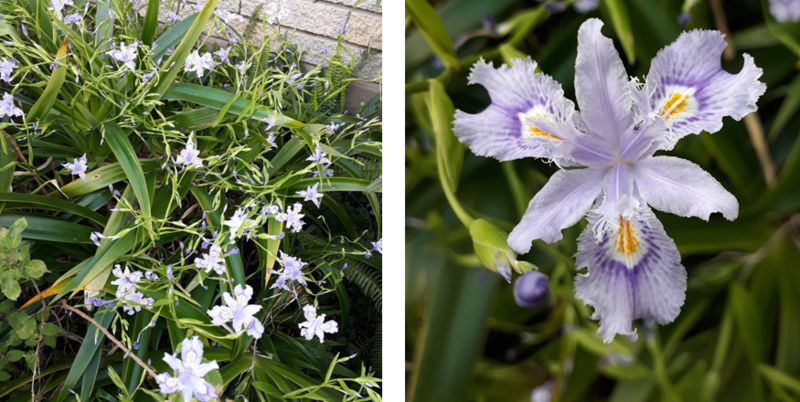 Many of our New Zealand iris lovers have these beautiful irises in their garden. I am talking about the “butterfly iris” or more correctly Iris japonica and some of the different hybrids. This iris is a native of China and Japan, a species in the genus Iris, it is also in the subgenus of Limniris and in the Lophiris section. It is a rhizomatous perennial plant, with pale blue, lavender or white flowers with an orange or yellow crest. It is cultivated as an ornamental plant in temperate regions. Often referred to as either a Crested Iris or an Evansia, and then there is Iris confusa. Confused, I sure am. I quite like the term “butterfly iris” and look forward to any discussion relating to the correct naming. This is one section of the iris world that I need to learn more about. Actually, as I started my research on these irises, I was rather surprised to fine how many I have, so more research and understanding is required. 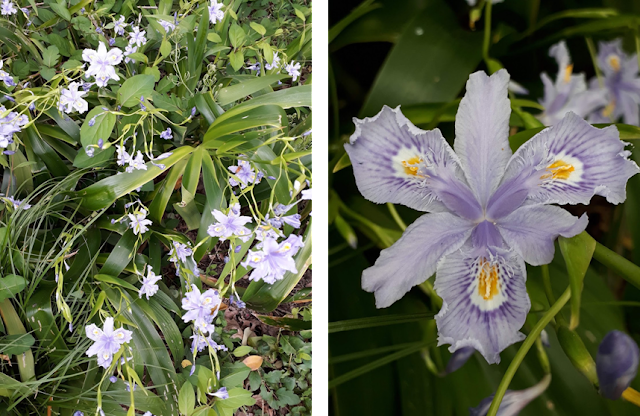 Named for a UK plants man Martyn Rix, this iris gets bamboo-like stems to 2'-3' (80 – 95 cm) topped by fans of long green leaves from which the long flower stems emerge bearing a swarm of dark blue-violet flowers which are deeper coloured than typical for the species. Another similar iris known as ‘Chengdu’, is often confused for the above iris. Similar in size but slightly different in depth of colour. Registered by Jean Witt in 1997, this Evansia SPEC grows to around 24” (61 cm). Standards and style arms are light lavender, the falls slightly darker, signal white with medium lavender halo and a yellow crest. Originally collected in 1980 by Jeanne Gardiner between Kanding, Tibet and Yaan, Sichuan, China around 3000’ elevation. Queen’s Grace is a cross between I. wattii X I. tectorum hybridized by Jean Stevens in 1955. 36" (91 cm), standards are clear lavender-blue, the falls same flecked deeper at haft; multi-ridges crest on falls, cream-white flecked brown. We still have a number of gardens where it is blooming in New Zealand. Registered by Mrs M Harvey in 1982, this Evansia grows to 54-60” (137-152 cm). It is pale lavender with pale gold crest on white zone, numerous deep lavender signal markings, pale lavender style arms with fringed tips; deep green foliage topping medium green canes. 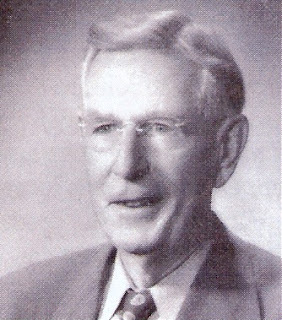 Parentage is an Ellis white sdlg. X Question Mark. In Part Two we will continue to look at what I have growing in my garden, and others from around the country. The AIS has many goals and objectives, and we need you to help us achieve them in the coming months and years, just as YOU have done before. 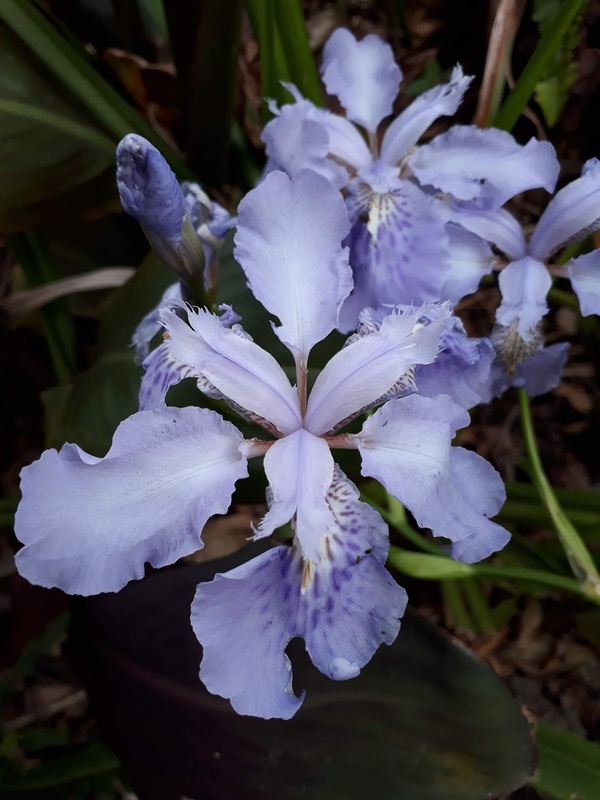 ~ We provide reliable information on irises of all types: including comprehensive information about the variables of growing irises in different terrains and climates, and that information is available to all for educational purposes. ~ We publish a beautiful quarterly bulletin that is so much pride to show our friends and family. 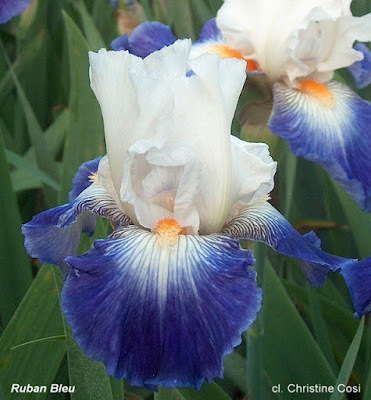 ~ We encourage scientific studies that benefit the continuously expand our knowledge and understanding of iris plants. ~ We keep a very steady and informative online presence via our website, and social media channels, Facebook, Twitter, and the AIS Blog, World of Irises. 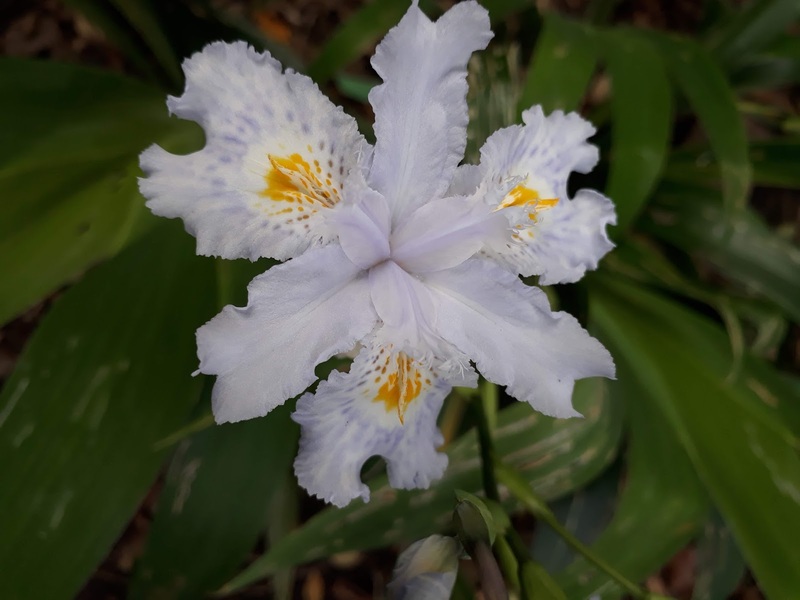 ~ We've created the Iris Encyclopedia, and continue to maintain and expand it, where thousands upon thousands of new and old irises, articles, and publications are made available to everyone, in digital format. ~ We support our members organize and manage a yearly iris convention that exuberantly serves as inspiration to the hundreds of participants from around the country, and the world, who get to attend. ~ We support local iris clubs, regions and societies in the U.S., and we also cooperate with others in several other countries. ~ We've created the AIS Library located in Molalla, Oregon where thousands of iris-related materials are carefully organized, stored and maintained. 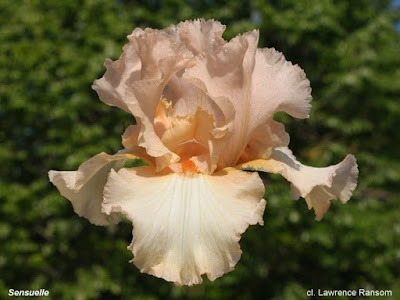 ~ We continue to be the worldwide registrar for new irises; a job we have done for many decades. ~ We strive to create iris programs, and encourage iris judges to educate others about growing irises in different climates and locations. So, from the bottom of our hearts a big THANK YOU! Lastly, we can only ask that if you have not become a member of The American Iris Society, please do. Your membership means a lot to us, it keeps us inspired to continue to work hard to achieve all the goals for our society, to expand, and to keep growing. If you feel so inclined, your donation before the end of 2018 is also appreciated. Our gardens abound in irises coming from the USA and Australia and soon they will be filled with varieties from Eastern Europe and even from Russia and Ukraine. I don't know if the world's gardeners know of the outstanding French varieties, but there is no shortage of them. And the quality of these French irises is not lacking as is demonstrated by the good results of the French hybridizers in European competitions in Florence, Munich, and Paris. I have put together a list of varieties from French hybridizers. Although this is just a beginning and there are many more fine irises, this text contains varieties of many different colors and patterns. To keep the lists simple, I have chosen only twenty irises, mainly recent introductions, which cover the whole spectrum of colors you can find in France. Let's start with the white. 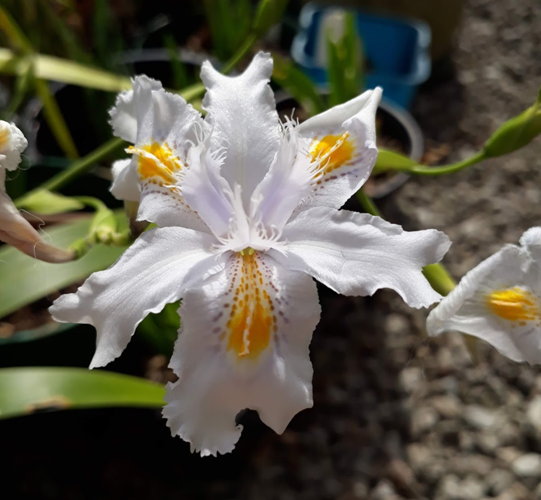 I propose a variety that seduced the judges of the competition FRANCIRIS© of 2005, as much for its perfect whiteness as for its remarkably drawn flowers. It is 'Gwennaden' (Madoré, 2001) (1). It is not an absolutely newest variety, but it always seems to me worthy to be included in this anthology. In yellow I chose 'Macao' (Laporte, 2009) (2). Coming from the crossing 'Magic Kingdom' X 'Lorenzaccio De Medicis', it is a deep yellow with brown-scarred sepals, which gives it "peps". 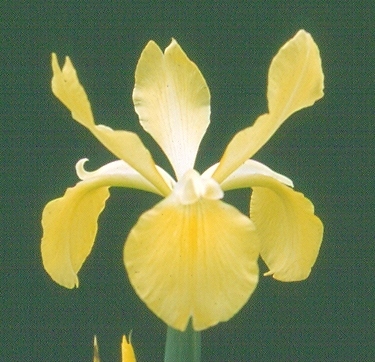 Bernard Laporte has obtained other interesting yellow irises, such as 'Féria de Nîmes' (2006) for example. From yellow, let's go to brown. For this color, I hesitate between two very beautiful irises: the famous 'Lumière d'Automne' (L. Anfosso (3) for Eric Besse (2009) and 'Tabac Blond' (R. Cayeux, 2006) (4). The first had a complicated history because it was not registered when it was placed on the market and it was only after a very strong demand from collectors that the plant received registration. The second is nevertheless a fine example of the talent of Richard Cayeux. Can we switch to orange? 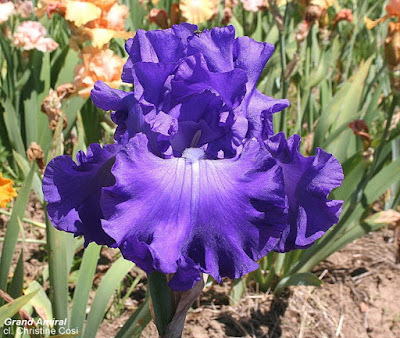 In this ungrateful color (in the irises, I specify) breeders from Britanny stand out clearly. Gérard Madoré first then Alain Chapelle (5) gave us very beautiful specimens, that's why I choose 'Baisers Dorés' (Chapelle, 2016), a flamboyant full-fledged orange, from 'Game Plan' X 'Leading Light'. It is a success. 'Terre de Feu' (Cayeux, 1997) is already 20 years old. It does not detract from its russet, red copper centered blue metallic; a color that we do not often find in the garden. In the reds it is necessary to start with the magenta tone and in this case I succumb to my affection for 'Mamy Framboise' (V. Fur / B. Laporte, 2004). Not only it is an iris with bright colors, but it is also a plant without problem, which grows quickly and well. In a more sustained tone, it is necessary to decide between the "old" 'Rive Gauche Paris' and its younger 'Bouschet' (Laporte 2006). 'Rive Gauche' (obtained by Vivette Sazio in 1993) was registered under the name 'Rive Gauche Paris' by Laure Anfosso in 2012. It is a little slow to develop, but what color! It is in the pedigree of' Bouschet ', who inherited his rich clothes, but enjoys a faster growth. In the numerous purple family, I designate 'Confiserie' (R. Cayeux, 2016). A little short on stalk, but richly colored, with a slightly rosy hue, very pleasant. His sibling 'Attirance' (2016), is not bad either, and looks like a twin! Mauve is a delicious color, always associated with iris. One of his champions was Larry Gaulter. One of the most successful people here is Lawrence Ransom (6). His 'Marie Kalfayan' (1994), with an orange beard that gives her verve, deserves to be included in this list. The same contrast between the beard and the rest of the flower is found in the light blue 'Princess Caroline of Monaco' (R. Cayeux, 1997). It is a plant which, for me, has all the qualities. I am not alone in thinking like that because it seems that it has received a great welcome all over the world. I propose another iris by Richard Cayeux to illustrate the bright blue color. 'Grand Admiral' (1999). This large and beautiful flower has proven itself and seems to succeed everywhere. Descending from two of the most popular blues, 'Memphis Blue' and 'Sapphire Hills', this is a fine example of the wise use of inbreeding. During the 18th century the amateurs hybridizers competed with one another about the black tulip. Today the black iris is almost the same challenge: nature does not know how to make black flowers naturally. Never mind, the most successful hybridizers have taken the case to the body and obtained flowers that now almost reach perfection. Among the recent French acquisitions, I have spotted two that have their place in this article. 'Penhir' (G. Madoré, unfortunately not registered) and 'Jais Moqueur' (A. Chapelle, 2016). But Bernard Laporte also had the happy hand with 'Dakar' (2009), enriched with spurs. Finally, in this difficult color, here we are with more pretenders than there is room! Let's finish with the selfs talking about pink irises. There is plethora! After much hesitation, I selected 'Sensuelle' (Ransom, 1999) and 'Succès Fou' (Cayeux, 2000). The first shows a hint of orange, but this is not unpleasant and, like all the Lawrence Ransom varieties, it has an incomparable class. The second, contemporary of the previous, oscillates between the pink "flamingo" and the pink "coral". A delicious flower. We are now talking about two-colored varieties. Starting with the many blue amoenas. I cannot decide between several particularly beautiful flowers: 'Barbe Noire' (R. Cayeux, 2012), 'Domino Noir' (R. Cayeux, 2012), and 'Princesse Laura' (Cancade, 2014) (7). Not only the flowers, with a sharp contrast, perfectly meet the criteria defining the amoenas, but also the plants themselves, make them indispensable to the iris garden. In the amoenas, there are not only the blues, but we must not forget the roses or the yellows. However, if for the blues, make a choice was not difficult, the other colors have made my life more difficult. Not too much for the pink amoenas, category for which I designated 'Chateau d'Auvers sur Oise' (R. Cayeux, 2003) for its fresh colors where the pure white neighbors with a tone of pink apricot very sweet, with beautiful ripples. But yes for the yellows in whom I did not find anything exciting. 'Infusion Tilleul' (R. Cayeux, 2013) is not exactly on target, 'Cadran Lunaire' (J.C. Jacob, 2012) (8) will rather be ranked among the distallatas. I fell back on neighboring varieties, but very pretty: 'Ma Veronique' (R. Cayeux, 2013), where the yellow dominates, or 'Mireille Sanne' (Boulon, 2016) (9) where it is the white who takes over leaving yellow only the top of the sepals. And reverse amoenas? This is not a subject that has inspired French hybrid breeders in recent years. I have selected two very successful varieties, which are in my own collection and whose vegetative qualities and harmony of colors I have been able to appreciate. They are 'Lune Bleue' (M. Bersillon, 1999) (10) in lavender blue on bluish white, and 'Somni' (R. Dejoux, 2008) (11), a subtle balance between petals of a very sweet primrose yellow and sepals very white. On the side of variegated iris, we do not miss anything! I choose a very recent variety of a young hybridizer who must go far: Stéphane Boivin (12). 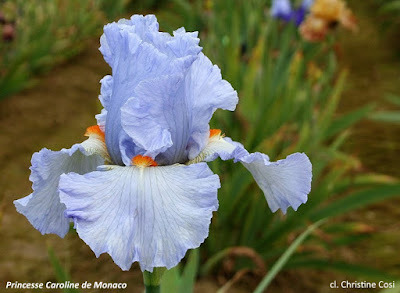 He has made a name for himself at the last two FRANCIRIS© competitions and each of his flowers is attracting attention. This time I put forward 'Aime Bay' (2015). Coming from two "must", "Montmartre" and "Décadence", it is a modern variegata, in shades of beige and purple. We return to a Richard Cayeux varieties for the category of two-color. 'Nelly Tardivier', (2012) has everything to please, especially a combination of original colors in fashion today. It's a variety that you must not miss! The plicatas are part of my favorite irises. There is not only a purple plicata on a white background which we can say that they are introduced too often but an infinite number of variations. I prefer to put here a flower issued from the production of the late Lawrence Ransom, chic and rare: 'Ma Dulcinée' (2015). Impeccably coiffed, stitched, and veined with old lilac rose (as the official description says), it is a jewel for the garden. In a model often met in recent times in America, 'Fleur de Feu' (R. Cayeux, 2012) is not bad either. Can we ignore the "broken color"? I do not think so, that's why I selected an original variety that grows well: 'Rose-Linda Vasquez' (2007) (13), created in the tiny garden of the hybridizer of the same name. This iris, which pleasantly mixes two shades of blue, is also an iris with spurs; he thus combines two very popular categories. Appeared in the early 2000s, the new category called "distallata" quickly spread in our small world. Everyone wants to have its own. I thought to put to this catalog the obtaining of the young Sébastien Cancade 'Martingale' (2014) that the Anfosso family described in its catalog as "Warm white on purple veined and golden sepals around the orange beard, wavy and delicately perfumed. I add another version, more "soft", signed by Jean-Claude Jacob, 'Cadran Lunaire' (2012), but I do not yet know its horticultural qualities. Let's end this inventory with the inevitable irises blue-white-red of the Cayeux's. In the long list of varieties of this kind, I propose 'Ruban Bleu' (J. Cayeux, 1997), last variety registered by Jean Cayeux, and admirable cultivar in all points. Thus ends this collection of French irises, very representative of what our national hybridizers can offer. With these irises, you can be sure to build an exceptional iris garden. But do not forget that this is just a sampling, necessarily biased. There are many other remarkable varieties obtained in France during the last twenty years! And new hybridizers appear every year, among who we discover real talents. (1) Gérard Madoré was a French customs officer, who hybridized irises for a long time but who ceased this work now. Another hybridizer, Jean Claude Jacob, took back the plants and put them on the market. (2) Bernard Laporte, during another life, was a postman. Now he is one of the best French hybridizers and he markets his own varieties. (3) The Anfosso family is well known all the world round. 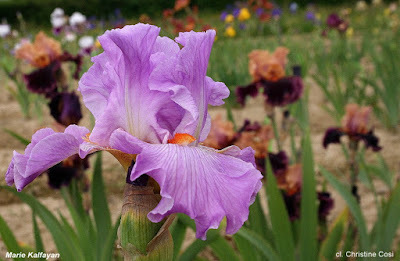 During the 80's they hybridized excellent varieties; after a long interruption, they began again working with irises. (4) Who does not know the Cayeux family? 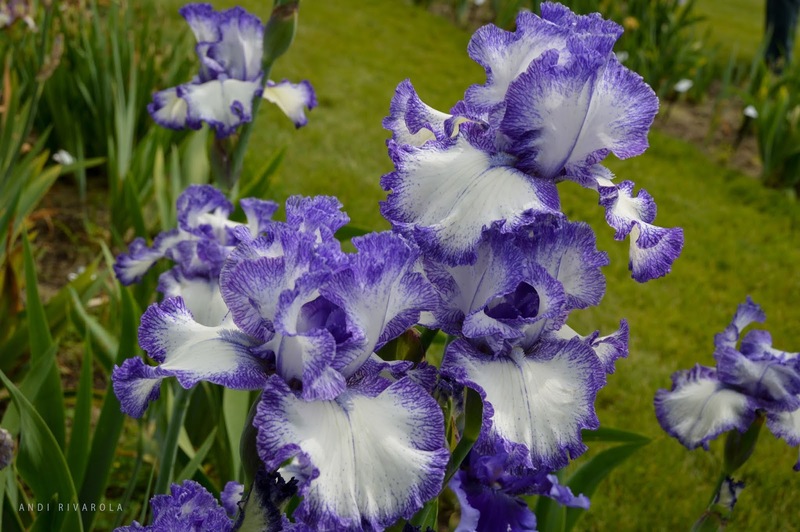 Since the beginning of the twentieth century they hold a prominent place in the world of irises. Their last representative, Richard, is one of the best breeders in the world and his varieties are known everywhere and by all. (5) Alain Chapelle has only been interested in irises for about twenty years. His irises, often brightly colored, are very representative of the renewal of hybridization in France. (6) Lawrence Ransom died suddenly in 2016, of British origin but settled in France for about fifty years, is an original irisarian, eclectic, and creative. 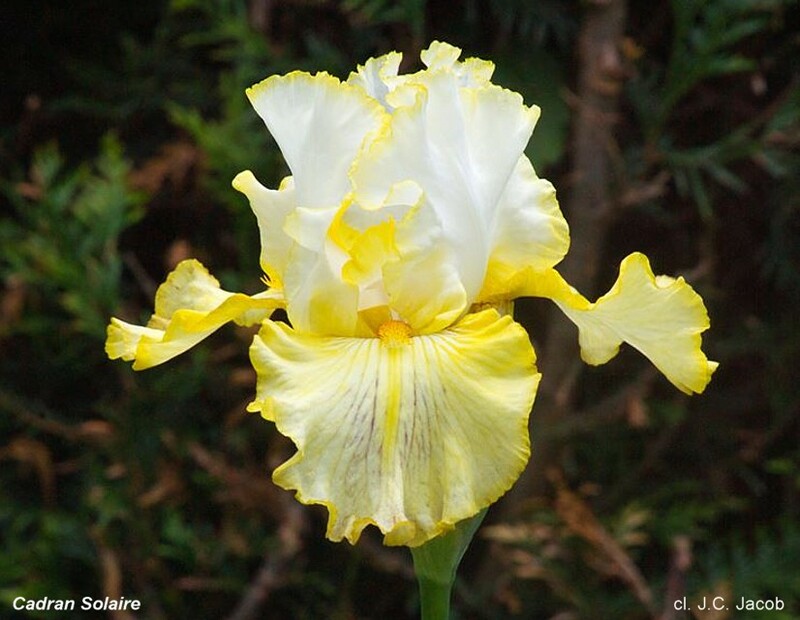 His irises are currently on sale by Roland Dejoux, President of French Iris Society. (7) Sébastien Cancade is a talented young hybridizer whose varieties are marketed by the company "Iris en Provence" of the Anfosso family. (8) Jean Claude Jacob also worked at La Poste before specializing in the hybridization of roses and irises of all categories. He markets his varieties himself. (9) Passionate about horticulture and particularly by irises, Jérôme Boulon makes crossings for his pleasure and that of his friends. (10) Michèle Bersillon was born in the USA. 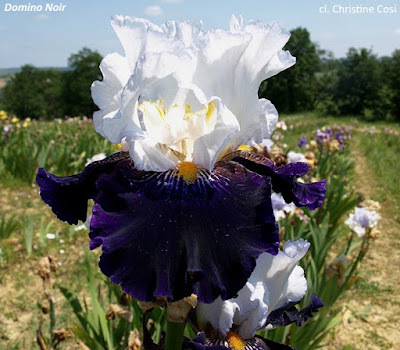 In France, she hybrids irises of a great delicacy of which some are on sale at Cayeux, but also at Stout's, in America. (11) Roland Dejoux is the current President of the French Society of Irises (SFIB). He markets his own irises. (12) Stéphane Boivin, an accountant, is passionate about iris and practices hybridization with great success. It is a great hope in this activity. 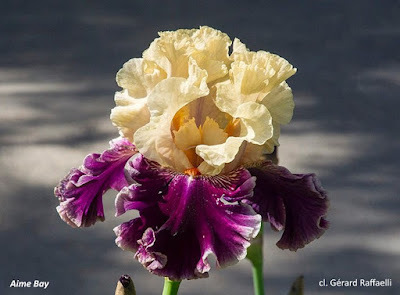 (13) In her very little garden, Rose-Linda Vasquez manages to obtain interesting irises which she sells herself to a small number of connoisseurs. 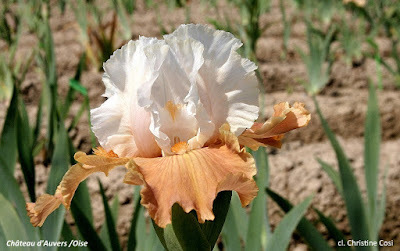 Editor's Note: The World of Irises editors have been concerned that the blog reflect irises growing around the world. We would have been pleased to add a new blogger Sylvain Ruaud in any case, but are doubly please to have him writing from France. 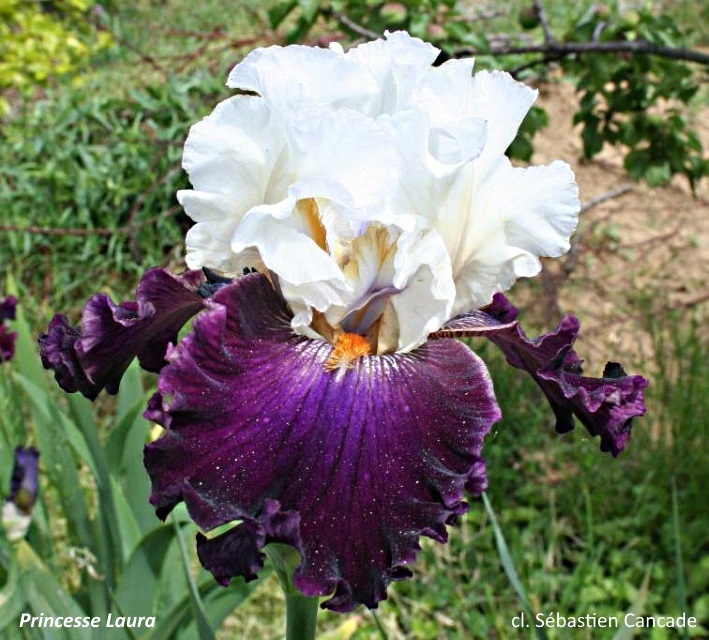 We look forward to hearing more from him about irises in Europe in future blogs. Sylvain has his own blog in French too. This is an experiment in one way--the text was machine translated and then edited and revised. For those reading the blog, if English is not your first language, we have added the translation feature to the blog. It can be found at the bottom of the left column. A warm welcome to those who are seeing IRISES, the Bulletin of The American Iris Society for the first time. 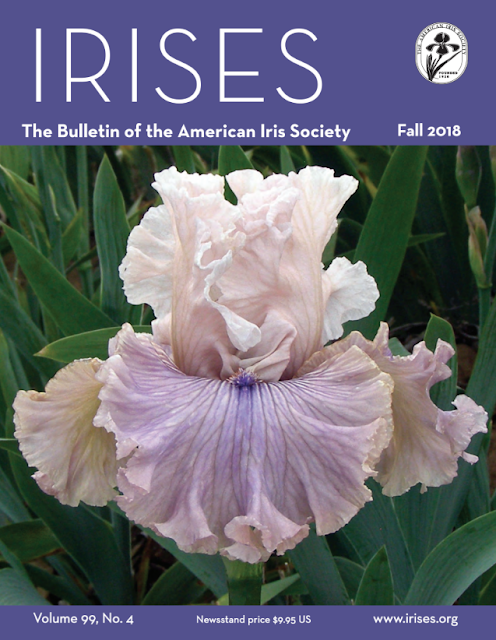 If you are a member of The American Iris Society I hope you enjoy this new issue. The Fall issue of the AIS Bulletin will be available for online viewing soon, and accessible via the Emembers section of the AIS website. The print copy has been mailed via the U.S. Post Office. On the cover this time, the Winner of the 2018 Dykes Medal, 'Haunted Heart,' by hybridizer Keith Keppel (R. 2010, TB). Congratulations! Note: to access this area of the website you must have a current AIS Emembership. (AIS Emembership is separate from the normal AIS membership.) Please see the Electronic Membership Information area of the AIS website for more details. Starting with beautiful pictures of all the 2018 Award Winners, on page 2 and 3, then it continues on pages, 58 and 59. AIS President, Gary White says goodbye, after three years at the helm, on pages 8 and 9. The list of AIS 2018 Awards is on pages 10 though 16. Don't miss the invitation to submit an article for the AIS 2020 Centennial publications. Details are on page 17. AIS NEEDS YOU! On pages 18 and 19 you will find detailed information about the 2019 AIS San Ramon Convention, and the registration form. Section Happenings are on pages 20 and 21, followed by dates of future AIS Conventions. On pages 22 and 23 beautiful images and article about International News, compiled by Bruce Filardi. Interested in garden photography? Here's an article for you by Neil Hoghton, Ready for Your Close-up? on page 24. Youth Views are on pages 25 through 27, compiled by Cheryl Deaton. 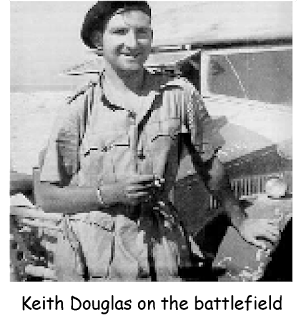 Remembering Friends gives us details on the life of talented long time AIS-member Perry Dyer, on page 28. A detailed article that can't be missed, Coming to Terms with Arilbred Medians, by Tom Waters, on pages 30 through 38. Scarlet Ayres, gives us information about New Mexico's The Big Dig, at the Mesilla Valley Iris Society, on pages 40 through 43. And, lastly, having soil issues? Please read, Improving Your Garden Soil, by Wilbur Bluhm, on pages 44 through 47. There's a lot more to see and read in this edition of IRISES, either in digital or print formats. For the last three weeks, a software glitch has prevented automatic notifications of The World of Irises blog. The coding error has been found and fixed and Monday you should have received notification about Bonnie Nichols’s blog on soft rot. You may have missed several blogs with interesting information and good images. Just click on the link and it will take you to the blogs in questions. Mike Unser’s blogs are always full of great images and the recent blog “The Beauty of Siberian Irises” is no exception. 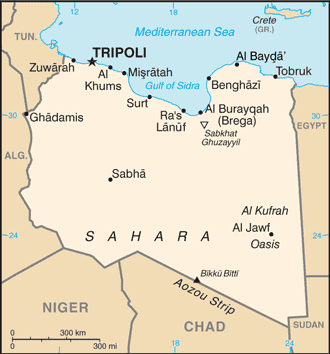 Anna Cadd has been hybridizing Spurias for many years and her guest blog provides historical and current information about the important parent Wadi Zem Zem. Texas has had 12+ inches of rain and counting……..the weather is cooler and the days are shorter. What is that icky smell in the garden?? The rain, while refreshing our lakes and absolutely necessary for all living creatures – can be a not-so-good thing for our bearded irises. The tall bearded irises seem to be more impacted than the smaller irises such as Standard Dwarf (SDB), Intermediate (IB), and border bearded (BB) – however, not exempt from rot. 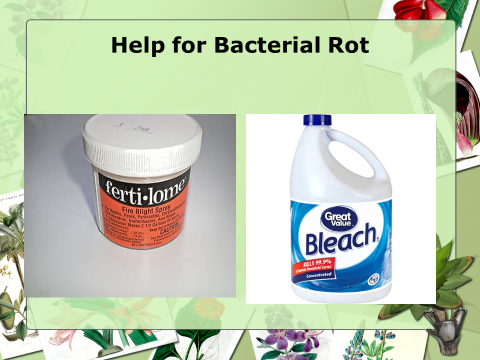 Bacterial rot can happen no matter the temperature. Bearded irises do not like a prolonged period of time with their roots and/or rhizomes soaked with water. Rot can happen quickly and can be deadly for irises. Be observant! While our neighbors might think we are “a bit” strange slowly and carefully looking at nothing but green irises leaves and not a bloom in sight – the earlier we can attack rot, the better our chances are of saving the rhizome. The outer leaves may turn yellow or the entire fan may be laying on the ground – these are definite signs of rot. The smell of rot is very unpleasant – okay, it is downright icky! Push on the top of the rhizome. If rot is present, the rhizome will be mushy. Sometimes maggots or small worms are already present. 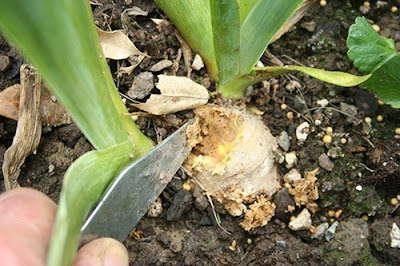 If you find rot, you can dig the infected rhizome. Digging this late in the season might be problematic to dig the rhizome and get it re-established before winter. 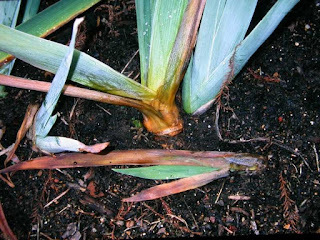 Irises need about 6 weeks to establish new roots. Whether you dig the rhizome or not, you must clean out all the infected tissue. You can use a sharp knife to scoop out the rot. THROW THE ROTTED tissue away! Do not leave it in your flowerbed. DO NOT reuse the knife until you have thoroughly cleaned it with soap and water. 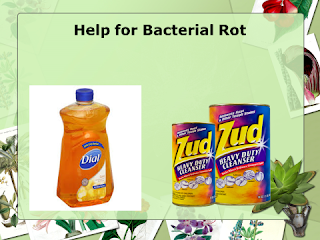 Once the rot has been removed, you can apply several types of products that may work to stop the rot. For the last few years, we used DIAL (not the store branch) antibacterial soap. The irises have either built up a tolerance to the soap and/or the manufacturer has changed the formula, because last year I had limited success stopping the rot with the soap. Another product you may try is BARTENDERS FRIEND, ZUD, or COMET applied directly to the area you removed the tissue from. When the DIAL soap was not working for me I researched for an older product than many of us used in the 1980s. We used AGRISTREP. You cannot find the product any longer. I researched the active ingredients of AGRISTREP and found that Fertilome Fire Blight Spray has common ingredients. Finding the product on store shelves is difficult and only a handful of stores carry it. I found it online through Amazon – buying one 2 oz container at a time. NOTE: There may be generic products on the market. To purchase through Amazon is about $12-$14 per 2 oz. You apply the product directly on the infected area. NO NOT dilute in water. You may have to apply multiple times (2 x per day) for a few days. I know the product is expensive; however, so was the $60 for my “favorite” new iris purchase. I found the Fertilome product at BWI through our nursery license. Wholesale, the product is appx. $10. Happy gardening. Don’t give up on the irises. They just need our help getting through the monsoon season to bloom for us in the spring.